You’ve heard the rumblings on Twitter and Facebook. That’s right. Almost 1 year ago, on June 14, I made my first post live launching what would become derryX.com mere months later. So with that, we’re having a little get together. June 11. SAVE THE DATE! Be a part of what will become a (maybe two) “derryX dines” post, and may also spiral into multiple other posts! We will start at Gus’s Hot Dogs in Watervliet, NY at 1pm. When we are finished gorging on mini hot dogs, sausage sandwiches, and grape soda, we’ll hop in our respective transportation devices and make the quick ride over to Snowman Ice Cream in Troy, NY. The afternoon will be packed with surprises. I am putting together a special, limited edition “derryX Funpack,” which will be loaded with fun. I’ve been putting a lot of time and a good amount of money into making these special. That’s why there will only be 13 available. And those are going to the first 13 people who arrive, at my discretion. I gave a quick peek into one of the elements of the funpack, but that’s all you’re going to know for now. There will also be a giveaway. The giveaway is open to all. 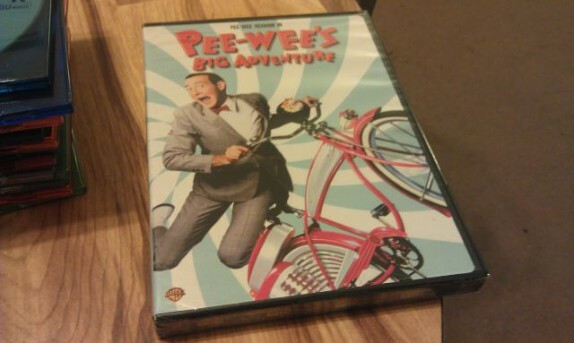 The prize is a sealed copy (purchased with money from my wallet) of Pee-Wee’s Big Adventure on DVD. In order to be eligible for the prize, you will need to bring a piece of paper, and perform the following task on that piece of paper. Write down the title of the blog post that has gotten the most traffic over the past year. We’re talking hits, not comments. In addition, you should write down a ballpark estimate of the number of hits the post has gotten in the past year. There are a number of hints scattered throughout this post that will lead you in the right direction. Good luck to all. So if you’re coming, reply “Yes” to the facebook event, and mark your calendar. You will be witnessing history in the making. If you’re not coming, I am truly sorry for you.